Editorial 1.1 will require iOS 7. I know that some of you won't like this, but sooner or later, it's inevitable, and all iPad models that run iOS 6 also support iOS 7, so this doesn't mean leaving any older devices behind. iOS 7 is so different from its predecessor that it's a lot more difficult to support older versions than it was with previous upgrades. As I said, it's not done yet, and it's always difficult to estimate release dates, but I still wanted to give you a little preview of what's next for Editorial. I second the comment about having mathjax local. Most of the time I don't have wifi access on my iPad. I need to have notes with math and every other app falls short. This app would be perfect with local mathjax. I tried to have a local MathJax folder in my dropbox. And it works after adding the mathjax <script>...</script> element in the markdown file with the link pointing to the local Mathjax folder. 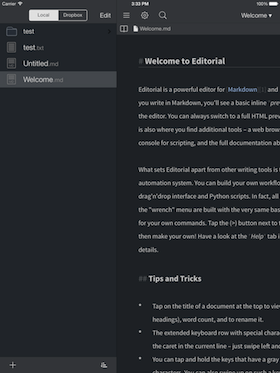 However, markdown seems to be parsing before mathjax gets control. Though a lot of the equations get parsed by mathjax, anything with a superscript is parsed by the markdown parser. Hence some of the equations look ugly. There might be other elements (in addition to superscript) where parsing fails. It should be possible to take care of this and also include a <script>...</script> to the local mathjax folder in the template used to render the HTML preview. Any news here? I am very interested in buying Editorial but I do not see any information if a update for iOS 7 will really come. Also I tried to ask questions in several ways (twitter mail and here) and never got an answer. That's really sad because good support for an paid app is important for me. He's probably busy. I imagine it takes a lot to develop and maintain an app like this. But to my knowledge, and I'm pretty certain, it's supposed to be in the near future. Though honestly, as good as the ios7 update screenshots look, I'd be okay with the app as it is now. It's pretty incredible. There's an excellent community here and the Workflows Directory has some good stuff. The app itself has good support really. I was unsure about buying it a few months ago until I read the MacStories review of Editorial. Check it out if you're curious and haven't already read it. It convinced me I wanted it bad enough, and needed it. There's also an iBook which is an extended version of Viticci's review there, with many workflows. If you mean info specifically about an iOS 7 update, stick around. It's definitely an awesome app as is, but I am looking forward, eagerly at that, to the iOS 7 update, judging by the screenshots above. Ole has posted that he's working on the new version and it won't be a new app. I find him very responsive to problems and issues. You're welcome. And peterh, I'm glad it won't be, I haven't even got to use TextExpander in the app. Jumped on the bandwagon after Apple made them change their ways. Of course,that's not a big deal with the in-app snippets and workflow possibilities. Plus, Editorial being what it is, if it were a separate app, I'd buy it right away all the same, now that I know. @omz I do enjoy surprises! I had an idea about the problem with rendering equations with the mathjax. Maybe we can do some sort of hash on the content between $ $ and whatever is used for the display math, convert to html and then unhash. This way the latex is not touched during the conversion to html. I don't think I have the know how with editorial to do this yet, but I thought I would share the idea. I find it amazing how little attention is given to the need of writing math. It took a while for ibooks to get it, currently no way to do it with pages on the ipad. Definitely a void. I was wondering if it would be possible to implement something like typewriter mode (like in iAWriter). When using bluetooth keyboard, sometimes I find cursor at the very bottom of the screen and have to use some empty paragraphs to see what I am writing. Keeping cursor in the middle of the screen would solve it. Looking forward to 1.1 anyway. I just recently purchased editorial & it's awesome as it is, but I'm looking forward to the textexpander support coming back in the next update. If I can make 1 more request - as a TaskPaper user whose ios app just stopped being available/developed, I would really like to see the editorial taskpaper mode included in the next update. Already, with all the workflows, editorial is recreating a lot of the desktop taskpaper experience possible through apple scripts. I would just like to check off some boxes or cross off some tasks is all. Thanks for a great app. It was worth every penny. Hi OMZ, Just wanted to add in a couple of feature requests as this seems to be the place for it. I have three requests that I would see as high priority for the workflows I employ whilst using Editorial. Also, having been a long term TaskPaper user it's sad that Jesse is no longer able to support IOS so I'd add my voice to some kind of native support within Editorial. 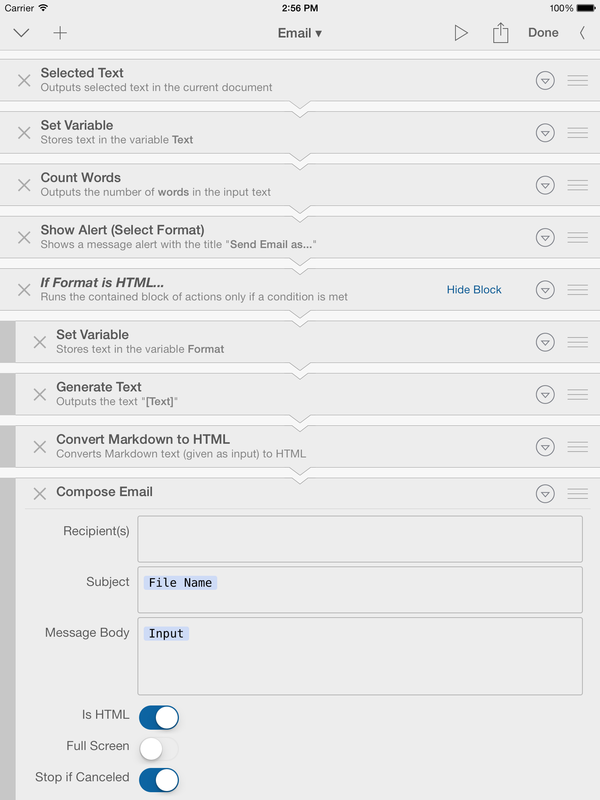 In saying that, I've moved my tasks over to TaskAgent and utilise the aforementioned LCP in-app Dropbox actions to append/prepend my TaskAgent inbox.txt file (works fantastically well because the TaskAgent syntax is so much simpler than TaskPaper). Being able to do this directly from Editorial would be really great. 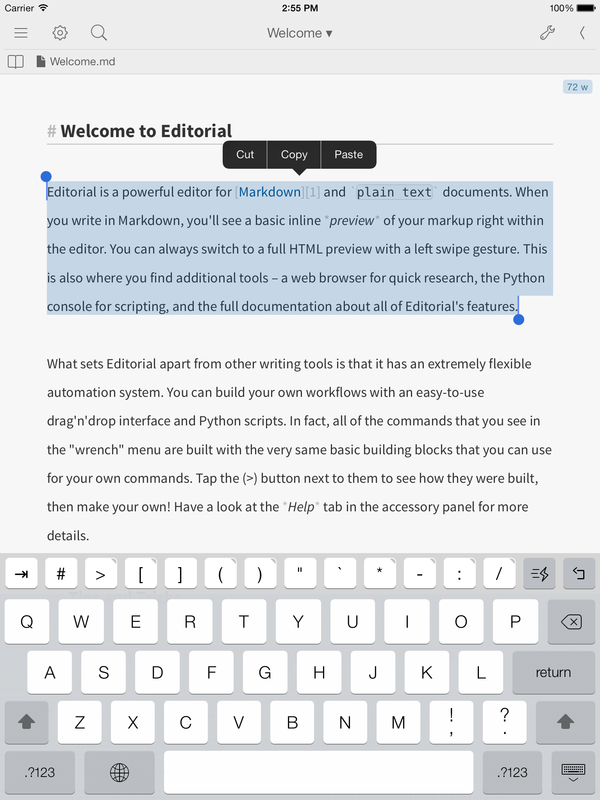 Thanks for creating a truly 'game changing' IOS text editor. I had moved back to my Macbook Air for all my productivity tasks but a combination of the iPad Mini Retina being such a great piece of hardware and Editorial's workflow system has changed all that. My iPad Mini is now my preferred writing medium full stop, not just the device I use when mobile. Not a feature request, but I wanted to quickly add my voice, in an expression of gratitude. Being a windows user by force of budget and nothing else at this point,I have no great text editors to choose from on my notebook. There are some that get the job done, but not well enough, and I suppose even with a Mac, my iPad would remain a primary writing device because of Editorial. It's game-changing, truly. 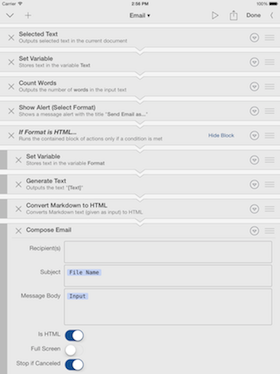 I would kill to have a text editor on my PC with this level of in-app automation. Windows at least needs something comparable to Automator, but alas every alt I've tried is garbage. Thanks for making and continuing to support this app! butch - on the PC, the free notepad++ integrates with several programming languages, one being Python. With several flavours of Markdown conversion available. And python functions to work with files being edited. I've been writing HTML with this for a couple of years. Sure, there are nothing like workflows. 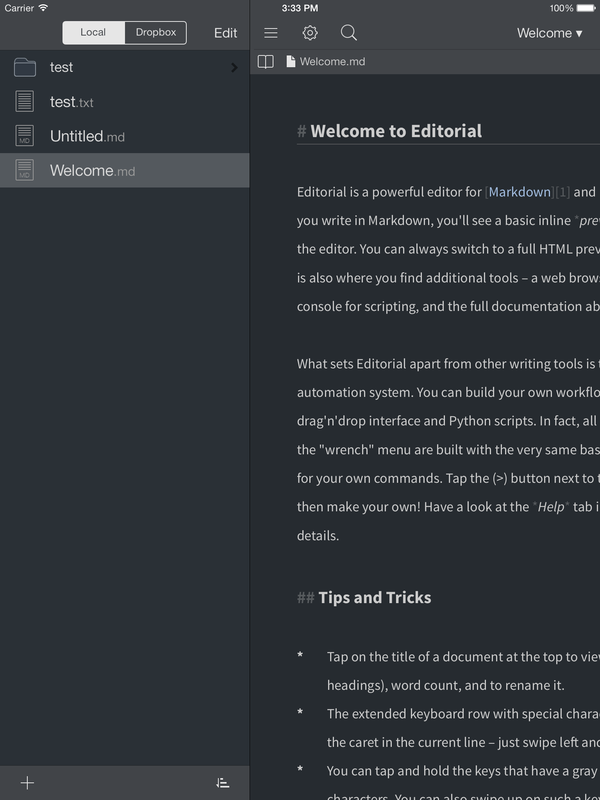 But with Editorial, as I get familiar with Python, I use fewer actions and do it more with one Python script anyway. Yes, N++ is sweet. I haven't used it a lot but I have done a little HTML in it along with a bit of Python in the Learn Python the Hard Way tutorial set. I would love to have a workflow setup but notepad++ is definitely a good text editor. I bought Editorial just a couple days ago. Great app and I'm really looking forward to the new 1.1 version. One request, though. While the Dropbox integration is nice, is there any chance of including other sync services too, like Box or Copy? Thanks much.